Student Council Meets City Council! On February 1, 2019, Philadelphia Councilman Derek S. Green graciously welcomed Belmont Charter High School’s student council members and their teacher, Mr. Julian Saavedra, to Philadelphia City Hall. Upon meeting Councilman Green, during his visit to Belmont Charter High School, Mr. Saavedra thought that it would be nice for the student council to spend more time with City Council members. BCHS scholars described this experience as rewarding. Not only were the students able to meet Councilman Green, but they were also able to meet his communications director and strategy manager. Councilman Green and his team were delighted to share their educational journeys and career experiences. 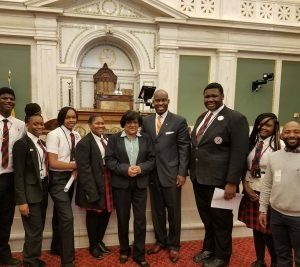 The day of the visit our students were also afforded the opportunity to sit in on a Philadelphia Council Caucus and received a standing ovation from Council President Darrelle Clark, city council members, and caucus attendees. Mr. Saavedra has expressed that the student council members walked away intrigued and grateful for this rewarding experience!